Our coalition represents agencies, schools, government, businesses, families, and concerned citizens in Tompkins County, all working to reduce substance abuse among middle and high school youth through the use of effective, evidence-based programs and practices. The next meeting of the Community Coalition for Healthy Youth is scheduled for Thursday, May 10, 3:15 PM in the Bev Livesay room of the Human Services Building, 320 W. State/ML King Jr. St., Ithaca. Contact Stacy at 274-6288 for details. All meetings are open to the public. Annual Youth/Adult Golf Event - Saturday, June 9, 9:00 AM Shot Gun start, Newman Golf Course in Ithaca. Details. Entry form. Donation form. Sponsor form. At our medication collection event on April 28 we collected 124 pounds of unwanted medications. Check back in fall, 2018 for the date and location of our next event. And don't forget that there are drop boxes in 9 locations across the county! 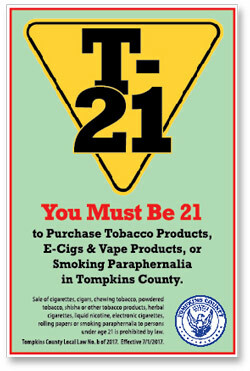 Tobacco-21 Tompkins County Legislature votes to raise the minimum legal age for purchasing tobacco products from 18 to 21, effective July 1. The Summary of Highlights from our fall, 2016 student survey is ready. Click here to read. The Tompkins County Legislature voted to increase the age for purchase of tobacco products in the county to 21. Details. At our April 29 medication collection event, over 500 pounds of unwanted medications were collected at 3 sites. Thanks to all who came and who supported this event. Remember that there are drop boxes across the county, some of them open 24/7, to dispose of medication whenever you want! Our third community forum on opioids focused on prescription drug, it took place on May 19 at the Ulysses Philomathic Library, Trumansburg. Thanks to our panel members and to all who attended. Today, Ithaca Mayor Svante Myrick released The Ithaca Plan which proposes significant changes to how the City of Ithaca addresses the problems of drugs and addiction. Many community volunteers contributed over the past two years to the plan development, including a number of members from our Coalition. While we may not support all of the Mayor’s recommendations, we are pleased that energy and focus are being given to these important issues and look forward to continuing to contribute to change in our community. The Community Coalition for Healthy Youth (CCHY) formed in 1997 in response to the death of a student from heroin. Since then, under various names and several managing entities, CCHY has worked to engage parents, youth, and community partners in reducing the use of alcohol, tobacco and drugs. If you are interested in joining our efforts, please contact us at 274-5310. Check out the Summary of Highlights from our biannual student survey given in fall, 2014. At our most recent medication collection event in September, 335 pounds of unwanted medicines were collected and delivered for incineration to Oswego. Since our first event in 2010, we have collected over 7,000 pounds from our collection events and another 3,000 pounds from our medication drop boxes which are available year round. The presentation is approximately 20 minutes in length and in that time participants can learn the tools to help cut underage drinking by 2/3! Contact Kris at Tompkins County Youth Services, 274-5310, to schedule a session for your staff meeting, workplace, faith-based group, civic organization, coaches meeting, or other group! 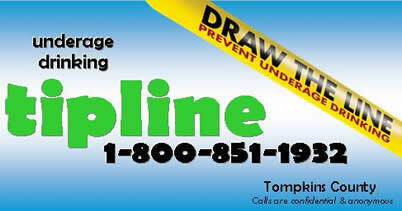 To report an underage drinking party, please call the regional Underage Drinking Tipline at 1-800-851-1932. The call will be routed to Tompkins County to the appropriate law enforcement agency who will respond. Underage drinking can be dangerous or deadly. Underage drinking accounts for 11% of all alcohol consumed in the U.S. And 90% underage drinking is in the form of binge drinking. Save a life! Make the call!